Beat the eggs in a bowl until well combined. Add the milk and mix well; this will make the scramble very soft. Heat the saucepan over medium-low heat. Melt the butter, when it starts to bubble add the eggs. Lower the heat and add salt and pepper. Stir constantly. Once it starts to settle add the vegetables and pepper. Keep stirring in a folding motion until you see the bottom of the pan. Once the eggs are ready, remove and serve over a flour tortilla or with a side of fresh Pillsbury™ croissants. You can use the vegetables of your choice like: mushrooms, squash, onion and spinach. You can also add cheddar or mozzarella cheese. 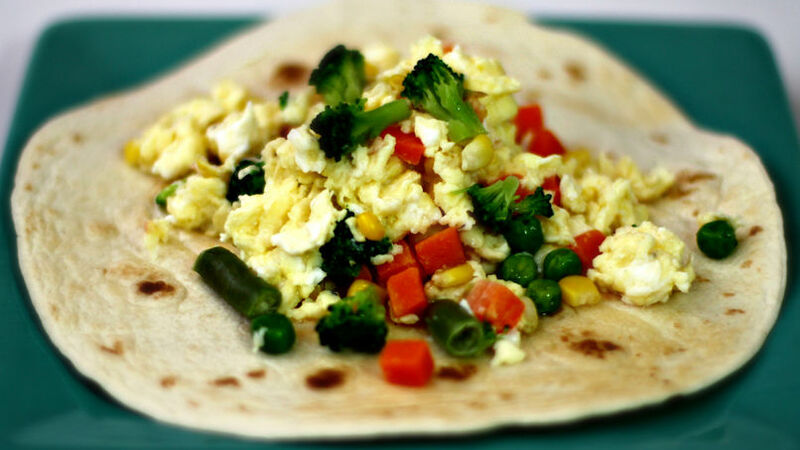 This recipe for scrambled eggs with veggies is a hearty breakfast that can be served at any time of day. It's also an excellent way to get your kids to eat their vegetables. It can be prepared very quickly and is always delicious. Now you can surprise them every weekend with a new breakfast.